This canvas depicts the meeting of several revolutionaries. They found a secluded corner, locked themselves in a dark room and discuss ambitious plans. A total of 13 people in the room, several of them are still very children. Despite such a young age, they are ready to fight for their interests. The company is sitting at a table covered with a white tablecloth. On the table are glasses of tea and an ashtray. Those revolutionaries show us incredible thoughtfulness. They constantly think, think over a new plan or, perhaps, prepare for a fierce battle. Probably the main character at work is a man with bright red hair. We do not see his face – he is a mysterious, unfamiliar person from the people. We do not care about his face, clothes, most importantly – his actions and thoughts. An interesting image shows the revolutionaries. 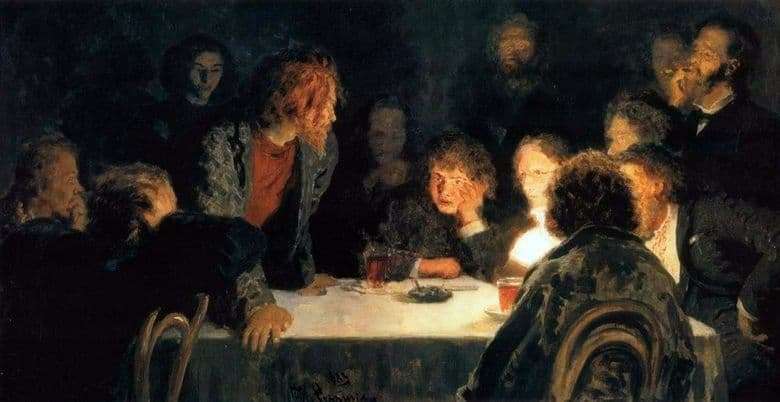 Ilya Repin clearly wanted to show that revolutionaries are ordinary people. They walk in the streets in typical for the environment clothes, do not stand out. The only and most important difference between them and the gray mass is that they have an idea. Their minds lit up with a thought that carries great power. Repin does not portray revolutionaries as heroes. Not! For him, all rebels are just people, and they hide strength and power within themselves. The idea of ​​stealth is shown by the artist also with the help of color gamut. The picture is quite dark and gloomy. The artist did not carefully draw the second work plan, thereby showing the blurriness, fuzziness and mystery of the meeting. The only source of light in the room is a small lamp that stands on the table. But we do not see it. The master did not paint the lamp itself, it only painted light faces. This is probably another trick Repin used to show us the power of a revolutionary idea. It turns out that there is no light source in the picture, but people are bright and bright. Their faces reflect the flame, symbolizing the bright idea.